Openly Secular is partnering with the Secular Coalition for America and their Secular Values Voter campaign, which seeks “to educate political candidates about the significant and rapidly growing secular constituency, the issues they care about, and the values for which they stand.” This Openly Secular Day, you can take part by contacting your representatives and letting them know that you’re a Secular Values Voter who believes in freedom, inclusion, equality, and knowledge, and who asks that all Americans be represented equally regardless of their faith or lack thereof. You can contact your representatives any time to tell them you’re a Secular Values Voter. 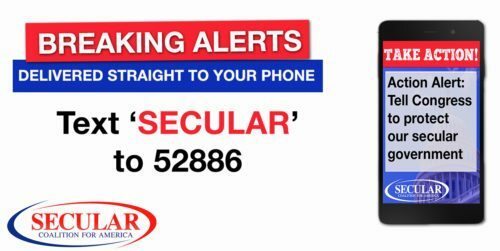 However, if you want to be sure to receive the Openly Secular Day action alert with specific messaging on October 19, sign up here or text the word “secular” to 52886. Invite a friend or neighbor with different religious beliefs out for coffee to exchange experiences about living with that belief identity. Organize an interfaith dinner or other event and invite secular people as well as members of different faith-based communities. Attend an already scheduled interfaith event in your community. If you need other ideas, you can always contact local nonprofit organizations and ask if they have work they would like volunteers to help with. If you need other organizing help, contact the Center for Inquiry’s Outreach Department at outreach@centerforinquiry.net. With a patchwork of state-level rules on voter registration, it can be frustrating to figure out where and how to get registered. Luckily, vote.gov is a great resource. Simply enter your state, and you’ll be directed to accurate voter registration information. If Secular Values Voters want to be a political force, the first step is to make sure we’re properly registered to vote! Share the link with your friends and on social media to make sure other secular people are ready to vote come election day. It can be hard to be open about your secular identity, and it’s okay to keep it to yourself if you’re in a position where being open would be detrimental to you. However, there is no better way to combat the stigma of a secular identity than by secular people making their identities known to others. When people personally know someone with a marginalized identity, it’s more difficult to stigmatize or vilify the identity. They can observe firsthand that any myths they’ve heard about secular people aren’t true, which may make them question what else they may have gotten wrong about secular people. By simply telling one person about your secular identity, you can help make the world more accepting for those who may not be able to be openly secular right now. No matter how you celebrate Openly Secular Day, be sure to participate via social media! Use #OpenlySecular for everything else Openly Secular Day!